No roads journey is impossible and boring, if you hire a bike in Chandigarh! Basically, Chandigarh is very royal and well-planned city of India and you need something royal to explore its natural and majestic beauty. Well-defined structure together with green cover makes its more scenic and demanding among tourists. Bike Rentals in Chandigarh is the best options to explore the beauty of Sukhna Lake, Leisure Valley, Rose Garden, magnificent work of Rock Garden and the majesty of the Capitol Complex. The major design of this city matches with French architect Le Corbusier. In fact, the archaeological sites prove the bits and pieces of the ancient Harappan civilization. Stonehead Bikes offers the activa and bullet on rent in Chandigarh which make your trip more convenient and exciting. 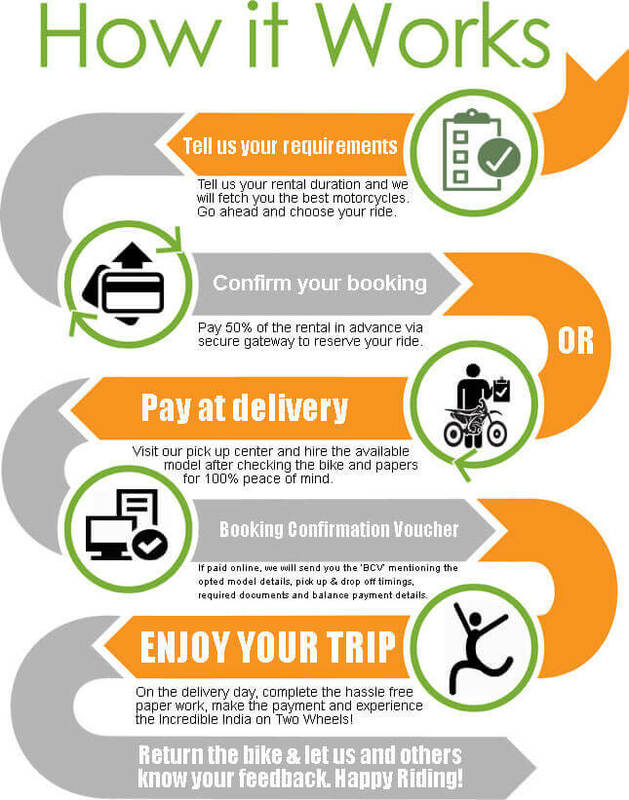 We come up with step-by step process of booking and make your trip more pleasant and smooth. Our online platform is the perfect example of user-friendly interface from where you can select the bike on rent in Chandigarh sitting at any corner of your house. You can choose the motorcycle and bullets of your choice from wide range of models and book it hassle-free. Get Bikes for Rent in Chandigarh and ride to the eco-friendly landscapes at pocket-friendly rate. We offer the top-notch bike rental services in Chandigarh. A person plan a trip to add its picture in book of memory and we cares for your fun and adventure. The process to take Bikes for Rent in Chandigarh is quite simple and trouble-free. The travelers only need to select the date, time and nearby pickup location and just make the payment online or offline. Once the payment is received, you will get a notification from Stonehead Bikes about the confirmation of booking. What makes Stonehead Bikes a demanding name in Bike Rental Services in Chandigarh? If you too planning for road trip for leisure valley, we are the perfect place to bike hire Chandigarh. Here you will find the wide choices starting from scooty like Activa or Dio to Superbikes like Harley Davidson or Aprilia or bullets.